Beauty and a sense of peace pervade this public garden. Jim Senko points out a feature at the beginning of the tour. Located behind St John Bosco Catholic Church, 10508 112th St SW, the Meditation Garden was the site of the Lakewood Historical Society's monthly program on Saturday, June 27. 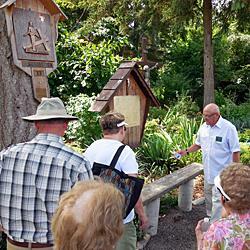 Jim Senko, the garden's creator, shared the story of how the garden came to be, then led guests through its 1.3 acres. 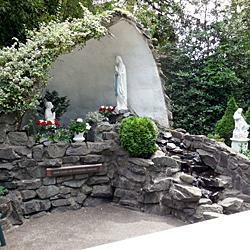 In addition to the Stations of the Cross placed along the gravelled path, each with a bench nearby where visitors who are so inclined may stop in contemplation, a beautiful grotto dedicated to Our Lady of Lourdes awaits at path's end. 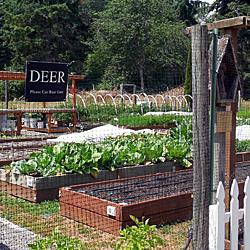 Designed to nourish bodies as well as souls, a food bank vegetable garden flourishes close by the Meditation Garden.